Oriental tobaccos always held and still hold some kind of mystery for me. When I ventured into the realm of the dark leaf latakia (also an oriental but hung in smoke), one of my first blends was Balkan Supreme. The word “Balkan” already made me dream of wonderful tobaccos harvested in far away exotic countries. 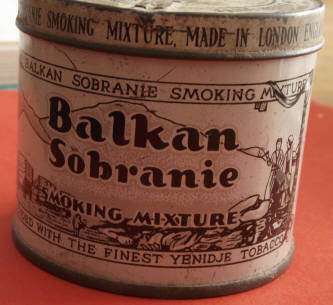 Of course when you are beginning your search for the oriental leaf you very soon stumble upon one of the most legendary mixtures ever: Balkan Sobranie Smoking Mixture. Written at the bottom of the old tins was: “blended with the finest Yenidje tobacco”. I had nooo idea what the hell Yenidje was but it sounded damn cool! So I started searching for information about Yenidje and soon discovered that it was an oriental tobacco. And that there were many more of them. First I want to discuss the term “oriental”. Because you also often hear “Turkish”. So what is it?? Well, “Turkish” and “oriental” are interchangeable terms. For centuries the Ottoman Turks of the Ottoman Empire ruled the Eastern Mediterranean. Precisely the region in which the oriental tobaccos were grown. Hence the name “Turkish”. For the next part I am leaning heavily on Milton M. Sherman’s wonderful All About Tobacco. Nowadays some is also grown in South-Africa. Each group derives its name from the city or production centre from which it comes (see the map above). And within each group, there are many varieties. The exact identities of each type of oriental tobacco are further complicated by the fact that similar tobaccos can be obtained from geographically different regions. Also, in a single region more than one type of tobacco may be grown. Because of the shifting population in the Macedonian areas (due to wars and changes among the ruling factions), the peoples of Greece and Turkey immigrated to new areas and set up communities named after those they left. Therefore, there is much similarity in the names of cities and towns in both Greece and Turkey. Names that also refer to the tobaccos they produce. Practically all oriental tobacco has its origin in a single strain of tobacco seed. Depending upon geographical location, soils and weather conditions, the plant produces a relatively small leaf that is highly prized throughout the world by cigarette and yes, pipe smokers. 1. Leaves vary in size from ± 1,5 inches in length and width to six inches in width and length. 2. Leaves have a fine, elastic and almost invisible vein system, that is generally free of wood tissue. This means that oriental leaf tobacco will cut evenly and will not crumble. 3. Turkish tobacco varies in colour from golden yellow to nut brown, depending upon the geographical area in which it is grown. 4. There is a very low nicotine content in oriental tobacco. Dr. Frederick Wolf (there he is again) attributes this to the scarcity of rain and available nitrogen in the growing areas. So if you are a nicotine wuss (like me), oriental tobacco could just be your thing. 5. Oriental tobacco is regarded as very mild, without harsh and irritating properties. No tongue bite here. The important Greek tobaccos are Basmas, Katerini (Samsun seed) and Bashi Bagli. Xanthi tobacco is a grade of Basma, coming from the area of Xanthi. It has the same outstanding qualities as Basma and the same variety of color. It also has a very strong but pleasant aroma. Djebel tobacco is another variety of Basma. It comes from the mountainous northern region of Xanthi. Although Djebel is similar to Xanthi tobaccos, it does have smaller and thinner leaves and its color is lighter. Djebel tobacco has a milder aroma than Xanthi and even better burning qualities. Mahalla is still another type of Basma tobacco that has thin, almost circular small leaves. These leaves have a very light, sweet taste, fine burning qualities and almost no aroma. Mahalla tobacco is grown in an area near the city of Kavalla (Cavalla) and is considered to be excellent for high-grade pipe tobacco. Another variety of Basma tobacco, Dubek comes from the Macedonian region of Greece. It has a light yellow leaf that is very aromatic and very sweet to smoke. Dubek tobacco is generally used to spice up pipe tobacco blends. 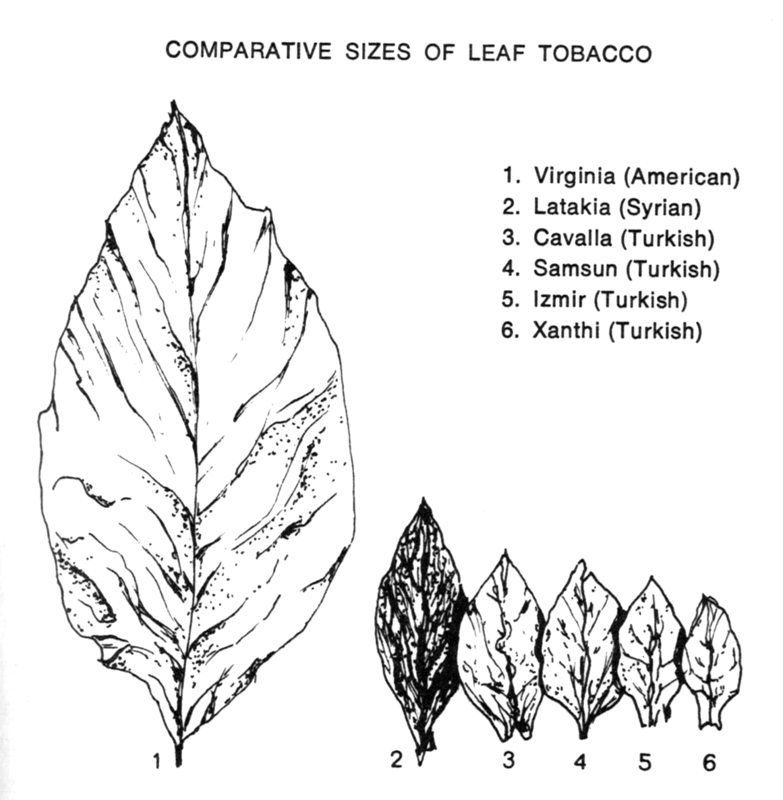 Kavalla tobacco has a larger, darker leaf than either the Xanthi or Izmir (Smyrna) type tobaccos. Although it is similar to Xanthi. Depending upon the crop, it can be much more aromatic than the Xanthi types. It is considered a medium type of Basma by the experts. One of the most famous oriental tobaccos, Jenidze (or Yenidje), is a Xanthi type tobacco. It is reddish brown in color and has a more distinct, stronger taste, with little or no aroma. Trebizond tobacco is a Bashi Bagli type of tobacco, grown in central and western Greece. The term Bashi Bagli comes from the Turkish word meaning “tied head”, which is the way the leaves are packed. The leaves of Trebizond are medium to large and the color of the leaf is bright, reddish yellow. Trebizond tobacco has a strong, sweet taste but little or no aroma and is consider a fine “filler” type tobacco. It also has a higher nicotine content than other varieties of Greek tobacco. Named after the Samsun district of Turkey on the Black Sea, Samsun tobacco has a small, heart-shaped leaf that is golden in color. The tobacco has a very pleasant taste and a delicate aroma. It also has excellent burning qualities and is considered by some experts to be equal in quality to the Basma-type tobaccos. This entry continues in part 2. Prachtig leesvoer over een heerlijke tabak verpakt in een mooi blog ! Staat onder de favorieten hier . Outstanding. I learned a lot reading this post. Excellent contribution! Thank you very much for this post. It gives a lot of good information on the matter. Thank you for reading Ivan! Hi again, do You have any information on bulgarian tobaccos? I am a researcher in the National institute for immoveable cultural heritage in Bulgaria and I am trying to connect some historical buildings – tobacco werehouses and factories with the rise of tobacco industry in the region. One of our most famous tobacco traders is Vasil Kucoglu (spelled as “Kutsooglu”) and in his memoirs he says that by the 1930s Bulgaria is exporting 50 milions kg of tobacco leaves for Germany, Nietherlands and the Countries of Scandinavia. Any official and unofficial information will be of great use for me because I am trying to connect the local historical significance of the buildings with the industrial impact of Oriental tobacco in Europe and the States. Some of the Bulgarian tobacco leaves were sold through the Greece and Turkey markets, because our traders found it an easier way to get the western markets. So it will be interesting to follow the route of the Bulgarian tobacco and what western blends were produced with it. You can for example search for “Bulgarian”. Be sure to unmark the “date” box and then show the results by date. Good luck! Thank You for the quick answer, I will search this website. I think the following article might be of interest to You: http://www.archdaily.com/784253/the-demolition-of-plovdivs-tobacco-warehouse-demands-a-new-response-from-citizens . This is an article about the destruction of one tobacoo warehouse in my hometown – Plovdiv. The tobacco industry in Bulgaria is in a steady decline these days, and also these buildings are now in the historical centre of Plovdiv, so the industry cannot continue next to the residential areas. The buildings are left with no intention for reuse in their original structure. We are now researching the whole complex, and I am trying to find more connections with processes from the era. I read most of the articles on Your site dealing with history of tobacco. Good work and thank You again! Hello Ivan, such a shame they tried to tear down such a beautiful building! I hope it can be rebuild and that people can live there or something like that.